Musée Mécanique's 'Hold This Ghost' album seemed in my humble opinion to be wrongfully missing from most of the 'Best Albums of 2010' lists. I loved seeing them perform at Pure Groove Records and then getting the chance to chat with them afterwards. 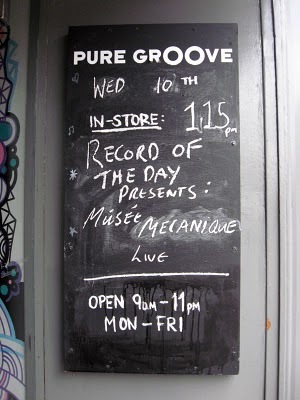 Almost a year after it's closure I still really miss the Pure Groove store and I know I'm not the only one. It's such a shame it had to close, it still feels like there's a gap in London's music scene that hasn't really been filled properly. Getting the chance to hear lots of new music and fairly often have a quick chat with the band in your lunch hour was just the best way to perk up an otherwise boring work day. I do realise living in London I'm more spoilt for live music than most but I just miss Pure Groove, that's all. 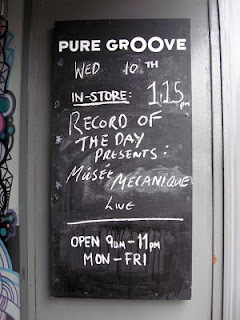 I should add that they are still spreading the word about excellent new music to the world via their online store at http://puregroove.co.uk/. Check it out.